When it comes to comic books, what scares you? Today at the Image Comics: We Believe in Horror panel, the creators present attempted to answer that very question. What with it being October and Halloween being less than a month away it seemed a perfect panel for the season. Featuring Will Dennis, the editor of comics like Moonshine and Gideon Falls, along with Matthew Rosenberg, Dennis Culver, W. Maxwell Prince, Pornsak Pichetshote, and David F. Walker, it was as thoughtful a presentation as anyone could have hoped for, especially considering it was one of the last panels of the day. 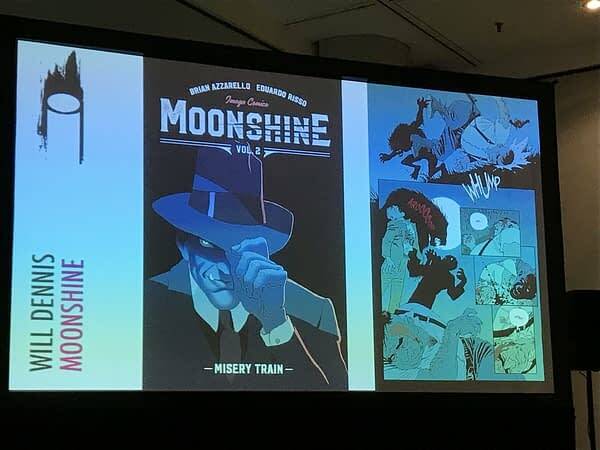 Image’s horror-themed panel wasn’t one of shocking revelations, as it mainly consisted of the creators simply telling the audience about what books they’d been working on for a while. 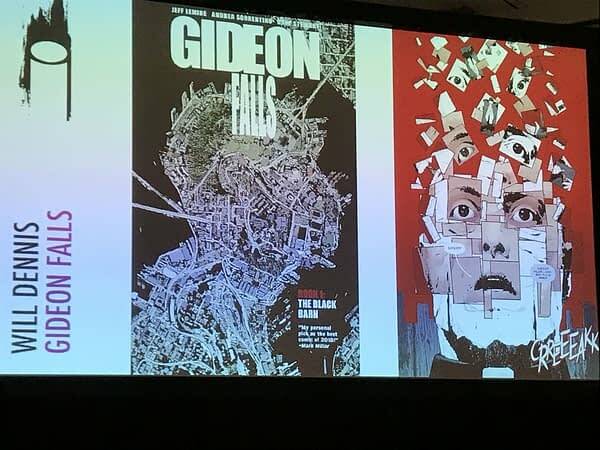 There was bit of discussion about upcoming comics like Wytches: Bad Egg, the 80 page prequel to the second story arc of Wytches, and Ice Cream Man #8, as it’s expected to come out on Halloween, but the meat of the panel lay not in the free advertising, but in the subject matter. 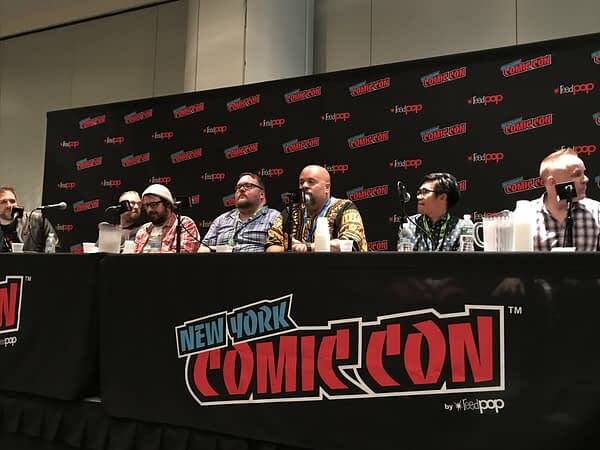 The Talking Horror In Comics panel attempted to offer insight into what scares people, along with the challenge in trying to make comics frightening for readers. Unlike TV shows and movies, which are easy to fall into, readers have to allow themselves to be forced into the experience of a comic. It’s not automatic and there’s no sinister music playing in the background, but rather the reader must allow for their imagination to serve as their primary guide. Yet as a whole, many of the creators on stage agreed that the horror genre is pretty great for a number of reasons, chief of all being that horror lets you end the story not well. That is to say that every character can die. Additionally, unlike other genres, horror works best when you subvert the audience’s expectations and disturb them in ways they weren’t expecting. The end of the Image panel realized the writers and editor talking about their first fears. David F. Walker said the original Night of the Living Dead terrified him. Will Dennis confessed that his babysitter took him to see Jaws when he was a child; it probably wasn’t a good idea. Dennis Culver admitted that unseen threats are what keep him up at night; that which hides right out of the corner of your eye. Matthew Rosenberg gave a sobering account, retelling an incident when he and his older brother came across some scary people, back when they were kids, and he remembers being horrified by the fact that his older brother was scared. As for W. Maxwell Prince, he sought to give the most depressing answer by explaining that when he was a kid, his biggest fear was being abandoned by his father. And so the question remains, what scares you?